Arrived on time, Very high-quality, overall very pleased! item exactly as described. fast & free shipping! thanks! arrived damaged but it was a painless return! awesome seller! thanks! Great price on item delivered quickly. Thank you. Item was as advertised. Thanks. There are some features I'd like to see more user-friendly (like the way the channel search results are stored, the FM antenna reception being dependant on certain positioning away from the receiver and the default mode not being selectable). However, in consideration of the cost and multi-function capabilities, for the price this is a fantastic value! The sound quality is outstanding! 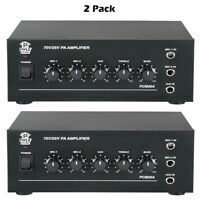 I've purchased two of these low cost amps in the last month. The second one was damaged from shipment and poor packaging, so I returned it. 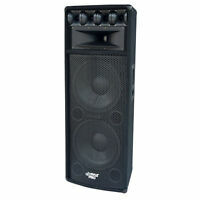 The first unit has a good sound through my new speakers but it has some limitations. The random feature only will work on an SD card or USB drive for about 1/3 of the songs of the 32 GB. The only way you can hear all of your music is from Bluetooth via a phone. The tone controls work fine and the FM radio seems to work too. I am not interested in the Karaoke feature. The remote is limited to about 20 feet. Once you switch to FM mode it takes at least a minute for it to go back to other modes. For the price it is a decent amp but don't bother with USB or SD, you'll be disappointed. Use the Bluetooth only and you'll be happy. Sound quality and general function good, clean assembly with good power supply. They misspelled BROWSE on the LCD display. This appears to have been designed by pasting together a receiver and a power amplifier. There is a MECHANICAL knob to switch between functions. So, if you think of this as a receiver connected to one input of a power amplifier that has 4 inputs, you'll understand it. When the knob is set to AUX, DVD, or CD then only the LOWER knobs make any difference. So to change the volume of your DVD input you use the big knob in the middle. Don't try the remote control, it has no useful effect in this mode. When the knob is set to MP3/SD then the upper knobs and LCD work as expected. The remote control will now work with the radio, SD, or USB drive. So, plus marks for decent quality parts. Minus point for just pasting two items together with a mechanical ABCD switch. They could have done a better job of integrating the parts so they work together with one remote control. Oh, POWER OFF on the remote just turns off the radio/SD/USB section. It leaves the backlight of the display on and the power amplifier is still on. 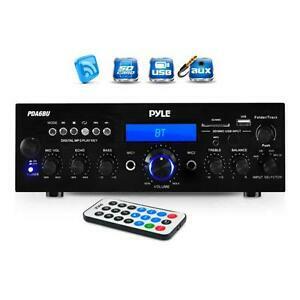 I purchased this as amp/receiver for my home office. I wasn't setting my sights too high given some of the reviews. But for the price, I'm overall happy with the unit, just wish the Bluetooth range worked better. Pros: Compact, packs a powerful sound for 100W/channel when matched with the right speakers Good unit for what you are paying. Cons: Bluetooth is intermittent, at best - (I use audio jake instead). Remote is very limited - basically it controls the Radio, Bluetooth and MP Player Overall controls could be improved - I painted tic marks on the black knobs with white out at indicators Instruction manual is weak. To set FM stations the first time you need to hit the || button (see note below about antenna). Caution: If you want to use a phonograph, you'll need an amp - the Pyle PP999 worked just great (bought on Amazon for $16.99). I purchased an "open box" version - so, not sure if I was missing the antenna or not. I had to purchase a PAL connector 75 Ohm antenna. Make sure you purchase a PAL connector! I received this receiver and right out of the box, the dial face did not show correctly and the remote didn't work. I don't mind the remote not working, but I would think the dial face would work correctly. The dial face lights up, but you can't read the function you're in. I work around that by turning on whatever unit I am using and listen for the music, etc. to adjust to the correct function on the unit. It's a pain doing it that way, but I did not pay that much for the receiver and I'm letting it slide. This unit has a lot of functions built in for the money spent. You can't find half of these functions on more expensive receivers. So far, it sounds great and has plenty of power to drive almost any speaker pair. I haven't tried all the functions yet, but look forward to using the mic inputs with echo and hooking up a cd or mp3 player. I have used the bluetooth function and had no problems hooking up with another device and sending a signal from the other device to this unit. Other then the two things mentioned not working correctly, this is a nice compact unit with a lot of features and gives you a nice bang for the buck.